The What: At InfoComm 2016, Bogen introduced two new models in its Apogee-branded line of professional audio amplifiers. Apogee's CA8000D and CA8000DX amplifiers offer cost-effective performance for permanent installations and commercial sound. The What Else: These CA-series amplifiers use the latest in amplifier technology, designed to provide the highest sonic quality, reliability, and reduced heat output, all at a great value. Both the CA8000D and CA8000DX are 2-ohm stable and can drive 70V lines directly. Both models are only two rack units in height, and feature front-panel level controls with tamper-resistant covers to avoid any unwanted altering or inadvertent adjustment. Fully featured, the CA-series amplifiers offer balanced inputs and four-pole speaker twist connector outputs. 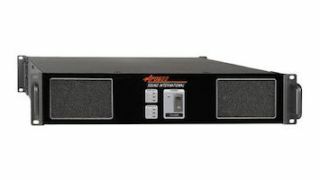 The DSP module is PC remote controlled using System Control Manager software—the same software used on the standalone, rack-mountable Apogee DLX24 digital loudspeaker controller.